The reason to grow your network is clear: the bigger your network, the more likely you are to know someone who can offer career help, whether by making an introduction, serving as a reference, or more. The easy way to build up your network is with current and former colleagues. But once those relationships are in place, and you’re connected on LinkedIn, how else can you expand your network? One option is attending networking events. They're designed to help people form connections. The trick is, first you have to find the right events. Get tips on how to find networking events, as well as how to make the most of them. Ask co-workers and friends about any professional events they’re planning to attend or ones they've enjoyed in the past — this can include breakfast discussions or networking events, happy hour events, conferences, roundtables, lectures and discussions, classes, and so much more. Your mentors are a good source for recommendations, too. Thanks to the internet, there are tons of ways to find events, conferences, and specifically networking-focused events, all categorized by geographic location. Meetup — Explore free and low-cost in-person meet-ups in your industry, whether it’s beauty, tech, photography, or something else. There’s also a category for “career and business events” with a wide variety of career-focused groups that meet regularly. Eventbrite — This event-based site has listing pages for free and paid events. You’ll find fairs, festivals, discussions, conferences, classes, and much more. Do you follow industry organizations on social media (Twitter, Facebook, LinkedIn, and Instagram) and subscribe to newsletters? Many organizations put on annual or even more frequent events. If you’re involved in media, publishing, or public relations, for instance, you’ll want to follow MediaBistro and Muckrack on social media and subscribe to their newsletters, since both organizations frequently host networking events, conferences, and host classes. Look for the organizations in your industry and follow them on social media and through newsletters. If you're not sure which organizations are big, ask colleagues, post on LinkedIn, or do a quick online search. Your college or graduate school can also be a rich source of events — they may host holiday parties which are an ideal place to make your elevator pitch and share a business card. Colleges and universities also frequently host events and conversations which are also a great place to meet people. Affinity groups form around interests, goals, and sometimes identity. Some organizations, for instance, have affinity groups for LGBTQ+ people, or for women, or for people with disabilities, etc. You can join a group at your office, or seek out one outside of your company. For instance, DamesBond is a woman-focused networking organization, while Out Professionals is a membership-driven organization that has job listings, networking events, professional development, and more services for members. For more places to find networking events, think local: your library or religious institution may host events. You may also find events open to all at community organizations, co-working spaces, and through your local chamber of commerce. Going to endless events can be fun or exhausting, but it’s not helpful to your career by default. 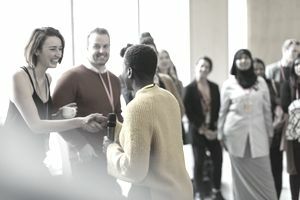 Here are a few tips on how to ensure that happy hour events, conferences, breakfast roundtables, and other networking events truly aid your networking, and in turn, your career. Expand your definition of networking. Some events are specifically identified as having the purpose of networking. But keep in mind that any time you meet someone — from a book reading to a crafting meet-up — is an opportunity to expand the number of people you know. Networking doesn't have to be forced; it can be a matter of making acquaintances and friendships. Be prepared with an elevator pitch. If there is something specific you’re hoping to get out of an event, come prepared with an elevator pitch. That is, if you’re hunting for a job, starting off a new business, transitioning careers, etc., be prepared with a 30-second quick speech of your background and experience, and what you’re looking for next. Follow up with meaningful contacts. Even a thousand LinkedIn contacts won’t help you if none of them remember who you are. It is a good idea to connect with people on LinkedIn — and, in general, can’t do any harm. But if you meet one or two people that you have an in-depth conversation, send a quick email or LinkedIn message to let them know you enjoyed your conversation.